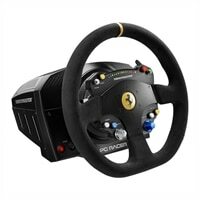 ThrustMaster TS-PC RACER Ferrari 488 Challenge Edition - Wheel - wired - for PCThrustmaster presents the TS-PC RACER Ferrari 488 Challenge Edition racing wheel. The TS-PC RACER is a powerhouse of technologies created to enhance gaming performance and offers a racing experience closer to reality. Face plate and 2 paddle shifters crafted from brushed anodized metal. Built-in LEDs for tachometer function. Hand-stitched wrapping. Very responsive motor for particularly dynamic and powerful effects, plus enhanced feedback. Maintains dynamics by ensuring that there is no overheating and while remaining silent. Provides more dynamics and heat dissipation. Thrustmaster presents the TS-PC RACER Ferrari 488 Challenge Edition racing wheel. The TS-PC RACER is a powerhouse of technologies created to enhance gaming performance and offers a racing experience closer to reality.